In a medium bowl, combine chicken, 1 tablespoon of oil, oregano, lemon juice, ½ teaspoon salt and ½ teaspoon pepper. Cover and refrigerate 30 minutes. Bring a large pot of water to a boil, add gnocchi and cook for 3 minutes, drain. Meanwhile, heat remaining oil in a large skillet over medium-high heat. Add the chicken and cook for 4 minutes per side or until golden brown. Transfer to a plate. Add the chicken broth to the pan; scraping up brown bits. 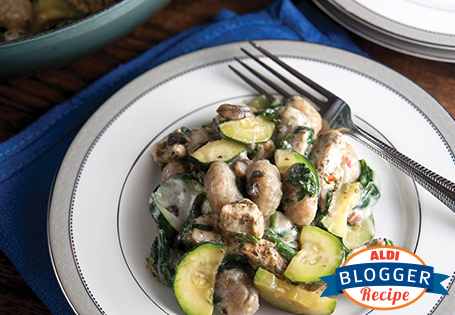 Add garlic and cook for 2 minutes, then add zucchini, mushrooms and lemon zest. Cook 5 minutes, stirring frequently. Add chicken and spinach and cook until chicken is cooked through, about 5 minutes. Stir in gnocchi and red pepper flakes. Remove from heat. Stir in yogurt. Season to taste with salt and pepper. Serve with lemon wedges. For more lemon flavor, stir the lemon zest into the yogurt. To enhance the flavor of the red pepper, add to the pan at the same time as the zucchini and mushrooms. This technique will release more oils and flavors during the cooking process.